The best part about working on a campaign is seeing how far you have come. It starts with few objectives the client wishes to achieve. Then it's off to work, uncovering all the roots behind the brand and/or product. From all the digging, unique selling points are discovered and a strategy starts to germinate. Petals of media placement, marketing tactics and creative executions pop out, creating a fully bloomed campaign. Below you will find a few of the campaigns I had the opportunity to help blossom. Joining as a Freshman, the American Advertising Federation (AAF) gave me four years experience in creating integrated campaigns from start to finish, before I even graduated college. This campaign was from my fourth and final year competing in the National Student Advertising Competition (NSAC). 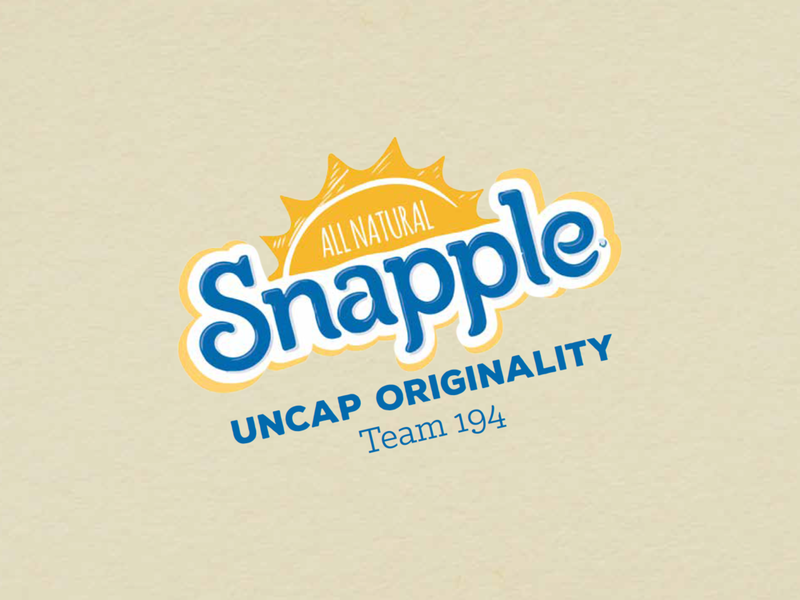 Snapple came to AAF for help with increasing the purchases of loyal customers, within their heartland of New York, along with transforming high brand awareness to top-of-mind in the rest of the U.S regions. As part of the creative team, I helped develop a strategy and create cohesive creative executions to reflect our campaign's purpose. Digital ordering was becoming a trend within food chains. Pizza Hut had a digital ordering system in place, but it wasn't getting enough use. The company came to AAF to get ideas on how to position Pizza Hut as the top choice for customers who order pizza digitally, along with a great user experience and to increase digital ordering from 43 percent to 75 percent of all orders. For this campaign, I not only served on the creative team, developing creative executions, I also served on the pitch team. Myself and 4 other teammates, presented a 20 minute pitch to Pizza Hut representatives and other advertising professionals. During my Advanced Copy and Layout course, we were tasked with developing a campaign for Harley Davidson's Superlow® Sportster. We had to target it towards mothers in their 30-40's. Working with one other person, we developed the Release Your Rebel campaign. This was a chance for mom's to feel alive again and give them the adventure they secretly longed for. We gave our headlines rebellious spins on what the "stereotypical" mom did in her day to day life. Along with ads, we also found an inspiring and edgy mom blogger to be part of our campaign. Another class project was for AHI Travel. They are a travel company that allows for the more seasoned adults to go on educational group excursions around the world. AHI Travel's target audience leans towards empty nesters, who have money to spend on themselves and are close to or are retiring. My partner and I decided to take these adults back to a youthful time when their imagination was their greatest adventure and show them that they do have their freedom to explore again. This isn't a full campaign, but we did have to tie together a public radio, a commercial radio placement and a banner ad.